This is a step by step tutorial that will walk you through setting up a Ruby on Rails application through Docker on Digital Ocean. Digital Ocean account. If you don't already have one you can sign up for a digital ocean account. If you have a real domain available use that as your hostname. Select the dokku app from the list of applications. Add your SSH key and create the droplet. Dokku is your own personal Heroku. If you are familiar with Heroku you know that it runs apps on the domain herokuapp.com. So if you deploy an app called hello it will be accessible at hello.herokuapp.com. When you set up dokku, you can create your own app domain. In your DNS settings create the following two A records. This means that if you deploy an app called hello it will be accessible at hello.apps.yourdomain.com. Of course, you can customize this and skip the apps subdomain if you wish. Where 123.123.123.123 is the IP of your digital ocean droplet. We need to check that the domain is configured properly on Dokku. The docs explain that if the hostname cannot be resolved at the time you create your dokku image, the domain may not be set. To check if the domain was set, log in to your droplet as root. You should not need to enter a password because the droplet is set up to use public key authentication. In my case, the VHOST file was not there. This was causing dokku to ask me for the dokku user's password when I tried to deploy the app. If you do not see the VHOST file, you need to create it. Add your development box's public key to the dokku user. This will allow you to push code without needing a password (sets up public key authentication). cat ~/.ssh/id_rsa.pub | ssh root@apps.yourdomain.com "sshcommand acl-add dokku dokku"
If you get any nginx-related errors, see the Troubleshooting section below. Install the postgresql client so you can access the database. Now run this command to set the environment variable DATABASE_URL that will be used in your Rails application's config/database.yml. Set up your app as you would for a Heroku deployment. You can read more about Procfiles here. Test your production setup on your local machine first. Foreman is a program that reads your Procfile and launches your application. Add your dokku remote to your git repo. On Heroku, they inject a custom config/database.yml into the app. In many projects database.yml gitignored. Sidenote: If you want to keep config/database.yml gitignored there are some things you can do, but I'm not going to go into that here. Hint: If you're using Puma you can play around with config/puma.rb. Exciting! Time to deploy. 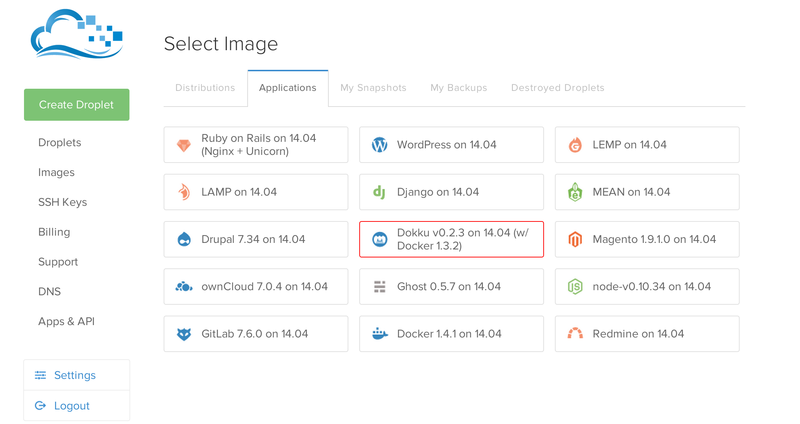 You deploy dokku apps the same way you would on Heroku. Push the master branch to dokku. This should trigger the deployment. Compressing objects: 100% (1236/1236), done. Writing objects: 100% (2023/2023), 1.53 MiB, done. remote: warning: You appear to have cloned an empty repository. See https://devcenter.heroku.com/articles/rails-integration-gems for more information. From the remote server, let's create and migrate the database. To find the container id you can run docker ps -a. You're done! Go visit your app url. If anything goes wrong at this point, check out the Troubleshooting section below. This error means that you are using an unsupported version of ruby in your Gemfile. Dokku seems to be using the Heroku Cedar buildpacks, so you need to use one of the ruby versions supported by Heroku. Other versions might be support which are not listed on this page. For example, 2.1.2 works as of the writing of this article. Anyway, choose a version that makes sense for your app. You visit your app url and gasp you get a 502. This means your Rails server did not start or there is some other reason why nginx can't reach your app. Where a1b2c3d4e5f6 is your container id. You can find your container id by running docker ps -a. In my case, I was missing the config/database.yml file in my Rails app. After a bit of googling someone suggested reinstalling nginx. When prompted, choose N to keep the version of /etc/nginx/nginx.conf that was configured when dokku was installed. This fixed things and I was able to run dokku plugins-install successfully. It looks like there have been some significant changes to the nginx-vhosts dokku plugin. Hopefully this fixed the issue.